Many soils of the tundra, boreal, subboreal, and subtropical forest zones are united into a humid soil group. The autonomous soils of this group include the following types: podburs, podzols, podzoluvisols, cambisols, alisols, and nitisols. Gleysols and histosols are the most typical example of heteronomous soils. Soils of humid environments are mostly a group of eluvial, leached, acid, unsaturated, sialitic and partly ferrallitic mesomorphic and hydromorphic soils. The total area of the Arctic and subarctic non-glaciated plains is approximately 180 million hectares or about 8.1 per cent of the total area of the FSU (Rozov, 1968; Simakova et al, 1996). Arctic soils (Figure 4.2) are unsuitable for agricultural use while the main use of tundra gley and non-gley soils is that for reindeer husbandry. Over 40 per cent of all reindeer pastures of Northern Eurasia develop on tundra soils. Soils of the polar deserts develop in the severe climatic conditions on marine terraces and recently glaciated lowlands. Both soil-forming processes and soil profiles are weakly developed. Silt and loam varieties dominate while gravel enriched units occur infrequently. The development of soils in the polar desert biome is strongly influenced by permafrost and associated cryogenic processes (Konishev and Rogov, 1977; Ignatenko, 1979). Tundra gley soils occur on the Arctic Ocean coast, their extent limited by the boreal forest in the south. They are mainly associated with clay deposits and rolling plains. In tundra, the depth of the active layer reaches 50-150 cm (see below). The most important morphological indicator of tundra gley soils is the presence of a gley thixotropic horizon in which the condition of clay changes from plastic to flowing mass and back under the influence of mechanical factors (Ivanova et al, 1970; Ignatenko, 1979; Vasilevskaya, 1980). Tundra soils are characterized by full alkalization from readily soluble salts and carbonates, content of raw organic matter of 10-40 per cent, high density, low porosity, and infiltration capacity. There is no strong differentiation of clay fractions and mineralogical components in soil profiles. 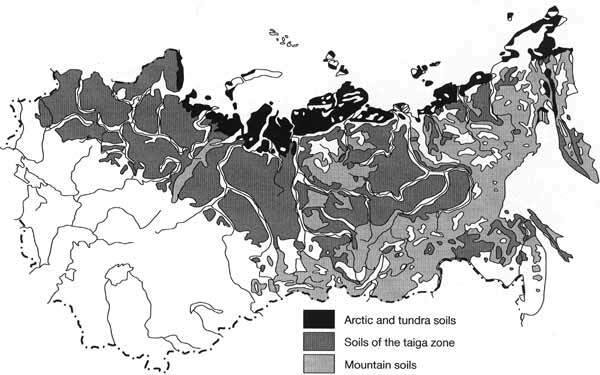 Tundra non-gley or illuvial-humic soils occur across the Arctic and subarctic but are more typical of the continental areas with biomes of typical tundra and forest-tundra. These soils develop on well-drained silt-gravelly deposits and sandy rocks (Targulian, 1971). The active layer of sandy and silt soils is greater than in loamy and clay soils. They are also characterized by better water permeability. This favours better aeration and creates conditions for leaching and alkalization. These soils have a low pH and clay accumulation in the upper and middle parts of the profile. 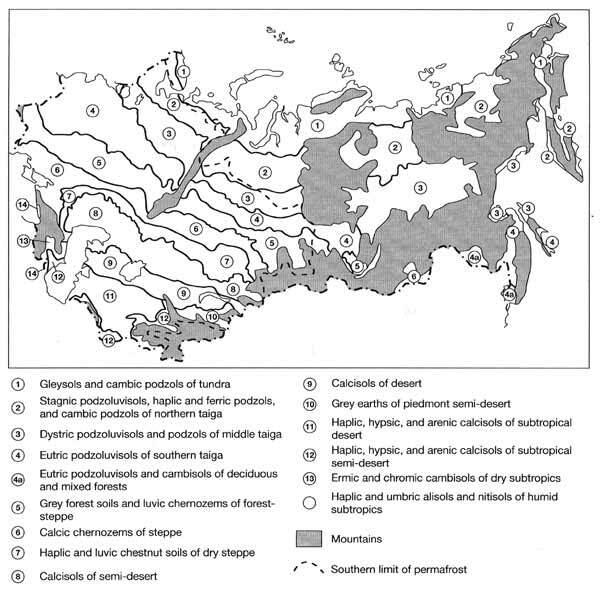 Podzolic soils constitute the main soil group in Northern Eurasia (Rozov, 1968; Simakova et al, 1996). Podzolic soils cover about 7 million km2 or 38 per cent of the total area of the FSU (Figure 4.2). 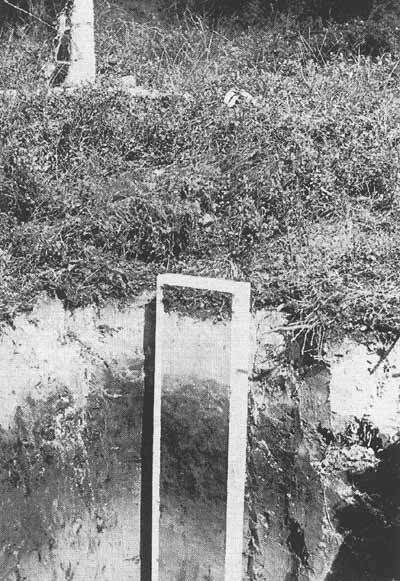 Gley podzolic soils are typical of the northern regions, changing into podzols and podzoluvisols in a southerly direction (Figure 4.1). They occur on both plains (west of the Yenisey) and uplands (east of the Yenisey). On the East European plain podzols develop on glacial and fluvio-glacial sediments, loams, and clays. The West Siberian distribution area is a vast weakly drained lowland. Gley podzolic soils develop under northern taiga in associations with mosses, lichens, and shrubs mainly on loam and aleurite deposits. The soils are very acid, their upper horizons have a low content of sesquioxides and are enriched by mobile iron. Podburs or cambic podzols develop in southern tundra, forest-tundra, and taiga regions on rocks with a coarse texture enriched by iron-bearing minerals (Targulian, 1971). They usually occur on the convex surfaces of moraine tills and on steep slopes in mountains. They are most typical of the north of European Russia, and Central and Eastern Siberia (Figure 4.1). Podburs are acid, temporally unsaturated soils with maximum contents of sesquioxide in the middle part of the profile. Podzols develop under the middle taiga with moss or moss-shrub vegetation. They are associated with rocks with a coarse texture, and small amounts of bases and sesquioxides. They form in the same bioclimatic environments as podburs (Rode, 1947; Targulian, 1971; Naumov and Gradusov, 1974; Mazhitova, 1987). In contrast to podburs, they develop on flat elevated surfaces and gentle slopes with good drainage. However, they may also develop in poorly drained depressions and around swamps. Podzol profiles (Plate 4.1) are distinctly subdivided into the eluvial part, with residual accumulation of quartz, and illuvial horizons with the accumulation of iron and aluminium compounds with humus. Podzols are very acid soils, unsaturated by bases, with low humus contents and a poor supply of nutrition elements for plants. The bleached, eluviated horizon is characteristic of most podzols. This is the source of iron and aluminium which are deposited in the lower (B) horizon. Podzoluvisols develop on loamy rocks poor in bases under boreal and subboreal forests. They are associated with moraine plains or mountainous regions. Podzoluvisols are distinguished by a clearly expressed differentiation of the profile into eluvial and illuvial parts, with the formation of a light podzol horizon in the upper part of profile. Soils have an acid reaction and low cation exchange capacity (CEC), and less than 50 per cent saturation by bases. Gleysols are broadly distributed under heteronomous conditions on flat, weakly drained plains, composed of coarse and medium texture materials. Their profile is usually represented by an organogenous horizon of varying thickness and with a diverse degree of breakdown of organic matter (from peat to humus) and mottled gleyish mineral horizons which are differentiated by their gley contents. 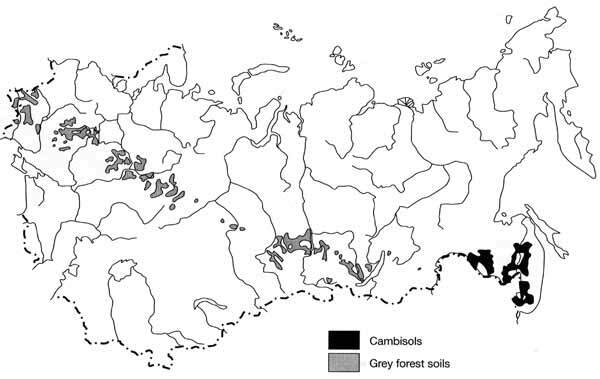 Cambisols develop on loamy rocks enriched by bases in well-drained environments in southern taiga, deciduous, and mixed forests (Figure 4.3). These soils also occur on steep slopes, in foothills, and intermountain depressions under conditions of good drainage. The western brown earth (cambisols) forest region occupies small areas in south-western and southern regions of the FSU on the Middle Danube lowland, and in the Carpathians. Cambisols have a limited extent on the southern macroslope of the Greater Caucasus and they also occur in the Far East. Although cambisols occur predominantly in forested areas, they are fit for arable agriculture. In the European part, cambisols are attached to loamy-gravel sediments and broad-leaved forests, while in the Far East they primarily develop under mixed forests. Typical of cambisols is a monotonous brownish profile with a gradual transition between the horizons. They are distinguished by the storage of the clay fraction in the middle part of the profile, an even distribution of silica and oxides with a limited accumulation of sesqui-oxides from the surface and a low acid reaction. They have a high water capacity and good water penetration is provided by a stable crumb structure across the profile. Yellow (alisols) and red (nitisols) earths are typical of the humid subtropics (Figure 4.1). They occur across limited areas in western Transcaucasia and in the foothills of the Talysh mountains in Azerbaijan, occupying in total about 0.6 million hectares (Rozov, 1968). Citrus crops, tea, tobacco, and heat-demanding plants are grown on these soils. Typical parent rocks are represented by the weathering products of andesites, basalts, porphyritic tufas, and sedimentary clay and sandy-clay schists in dissected terrain (Romashkevich, 1974, 1988; Zonn, 1987). Alisols are formed on loamy rocks and well-dissected slopes in hills and low mountains under subhumid subtropical forests. They occur in Azerbaijan and locally in western Georgia and Abkhazia. Alisols are distinguished by a differentiated profile and high clay contents in the middle and lower parts of the profile. Profiles are differentiated by their contents of clay and sesquioxides with a maximum in the В horizon. Nitisols are limited to a small territory in western Georgia. They are distinguished by the presence of a ferrallitic clay-accumulative horizon in the middle part of the profile and the absence of a morphologically expressed light eluvial horizon above because of its colouring by humus and thinly dispersed iron oxides. They have low CEC and are unsaturated.